Home | Disney and Animation Art | Disney Feature Films | Frozen | Victoria Ying Signed and Numbered Giclée on Archival Watercolor Paper:"Build a Snowman" OFFICIAL | Gallery Direct Art | 800-733-1144 Free Ship. No Tax. Victoria Ying Signed and Numbered Giclée on Archival Watercolor Paper:"Build a Snowman"
About The Artist: Disney Artist Victoria Ying was raised in Southern California watching Disney Films and reading comic books. During middle school she'd already made up her mind that she wanted a career in the arts, and after high school attended Art Center College of Design in Pasadena, California where she majored in Illustration with a minor in Entertainment Design. Determined to pursue a career with Disney, she worked first at Imagineering before transitioning to her current position at Walt Disney Animation Studios as a Visual Development artist. Her work has appeared in the films Tangled, Prep and Landing, and many other up-coming, but as yet unannounced, projects. Home | Fine Art Prints & Limited Editions | Collectors Editions | Disney Fine Art | Victoria Ying | Victoria Ying Signed and Numbered Giclée on Archival Watercolor Paper:"Build a Snowman" OFFICIAL | Gallery Direct Art | 800-733-1144 Free Ship. No Tax. Home | Disney and Animation Art | Disney Fine Art | Victoria Ying | Victoria Ying Signed and Numbered Giclée on Archival Watercolor Paper:"Build a Snowman" OFFICIAL | Gallery Direct Art | 800-733-1144 Free Ship. No Tax. 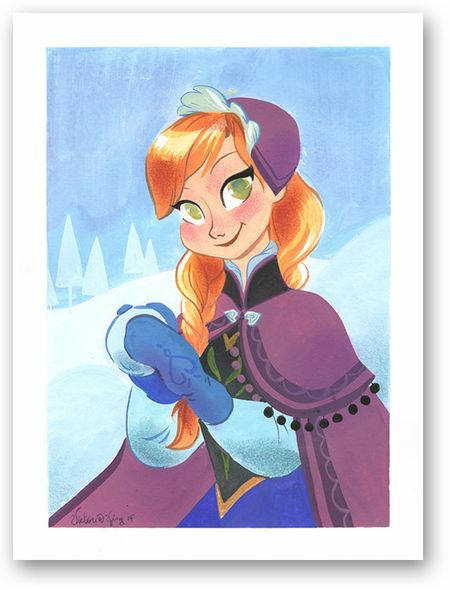 Home | Disney and Animation Art | Disney New Arrivials | Victoria Ying Signed and Numbered Giclée on Archival Watercolor Paper:"Build a Snowman" OFFICIAL | Gallery Direct Art | 800-733-1144 Free Ship. No Tax.